PLEASE NOTE: The Baader T-2 90-deg Prism Diagonal (with Zeiss Prism) consists of a diagonal body with prism only. It is provided as a basic component, without any nosepiece or eyepiece holder. It incorporates standard T-2 threads at the input (female T thread on the telescope side) and output (male T thread on the eyepiece side) faces. This permits the diagonal to be used as a compatible component along with the other Baader Planetarium T-2 adapters and accessories. The Baader Planetarium T-2 Prism Star Diagonal is easily the finest prism star diagonal available today. 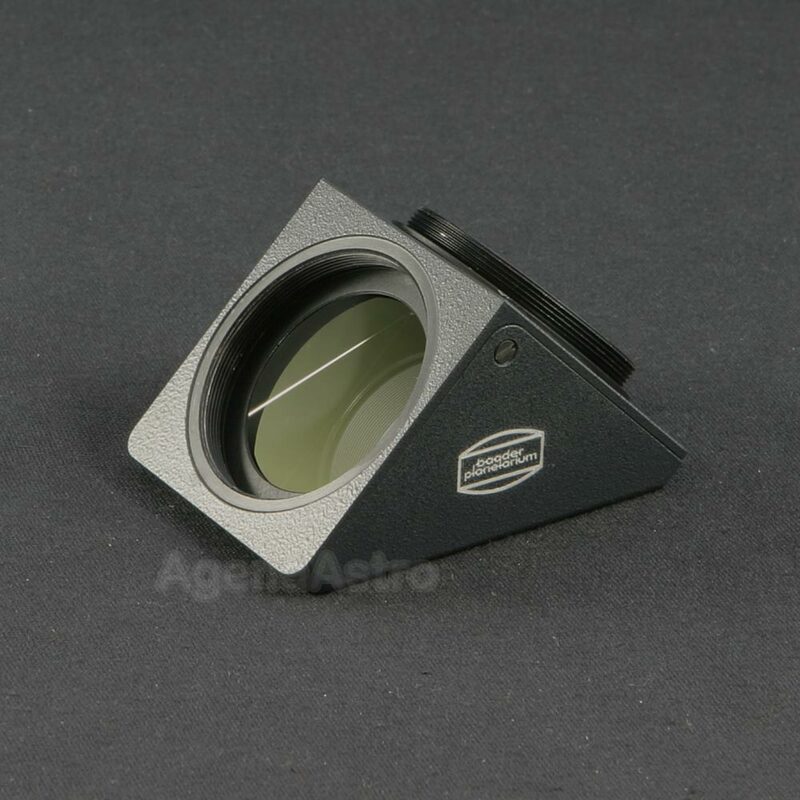 The right angle prism is produced by Zeiss and is the identical prism that Zeiss supplied for use with their exquisite APQ telescopes. The famous Baader Planetarium 7-Layer Multi-Coatings ensure the image is bright and contrast and the oversized prism provides an oversized full clear aperture of 34mm / 1.34". Like all the Baader Planetarium products, the mechanical quality and finish are superb. The precision machined aluminum housing provides a stress-free mounting and precise location for the prism, unlike the typical weak plastic or crudely cast housings found on lesser diagonals. Extremely low scatter and high contrast images are the hallmark of this prism diagonal. The end result is a lifetime diagonal that matches or exceeds the brightness and image quality of the finest mirror star diagonals. Users of fine refractors over f/7 as well as SCT users have found that the Baader Planetarium T-2 Prism Star Diagonal provides the sharpest and highest contrast images they have seen from any star diagonal, mirror or prism. Modular T-2 System Design: The design of the T-2 Prism Diagonal enables it to be configured to exactly suit your needs. The input and output T-2 threads integrate with the full range of Baader Astro T-2 System components and other T threaded adapters. The telescope side can hence be configured to fit in 2" or 1.25" focusers, as well as directly on telescopes with specific threads such as original M44 Zeiss threads, Vixen OTAs or Russian Maks. The eyepiece side can be used with Baader's quick change ring #6 in order to mount the Mark V binocular viewer instead of an eyepiece (in order to achieve the shortest possible backfocus distance between telescope and binocular viewer) or alternatively mount 1.25" (not 2") eyepiece holders. It is also the perfect diagonal for use with the Baader / Zeiss Giant Binoviewer (replaces the normal prism diagonal). Not just a visual accessory, this diagonal also integrates well into digital imaging applications. The effective optical path length of the base T-2 Prism Diagonal with Zeiss Prism is 41mm. I use this with 1.25" and 2" nosepieces and with Eyehold 2 at the eyepiece end. I've primarily used it with SCTs to date and a small refractor. I have had the Baader Prism-1 for the past year and it was fun to compare it with this Zeiss spec prism. As good as Prism-1 is, this showed itself immediately to be better in terms of contrast and fine detail. Splitting Izar with an older C5 was a memorable image when comparing it at the same time with other diagonals I had available (mostly dielectric mirrors). If I could give it more than 5 stars, I would. To me, it is well worth the price of admission, being the finest diagonal I have used in decades. I now own and use two of these terrific diagonals. One of the best things about the T-2 design is being able to attach directly to accessories; I bought this second one specifically for use with a filter wheel. With the T-2 direct connection, I gained more than an inch of back focus (shorter light path) so everything comes to focus in my scope. The Zeiss spec version also has a slightly larger clear aperture so that 2" eyepieces with field stops up to 34mm can be used without vignetting... but if you intend to use a 35+mm eyepiece, you will need a 2" diagonal if you do not want it to vignette. Performance is first rate. I especially like this prism diagonal on close double stars with a magnitude difference where its reduction of light scatter often allows a clean split. This is a fine diagonal. Review by Dave of Des Allemands, LA. I installed this diagonal on my LX200 12". I machined my own adapters from brass to install Denk binos. It works great. Very secure connections with no chance of accidentally coming off. I've only used it for one viewing session but mosquitos were too bad to concentrate on the view. There should be a clear label on the diagonal that it is Zeiss prism.